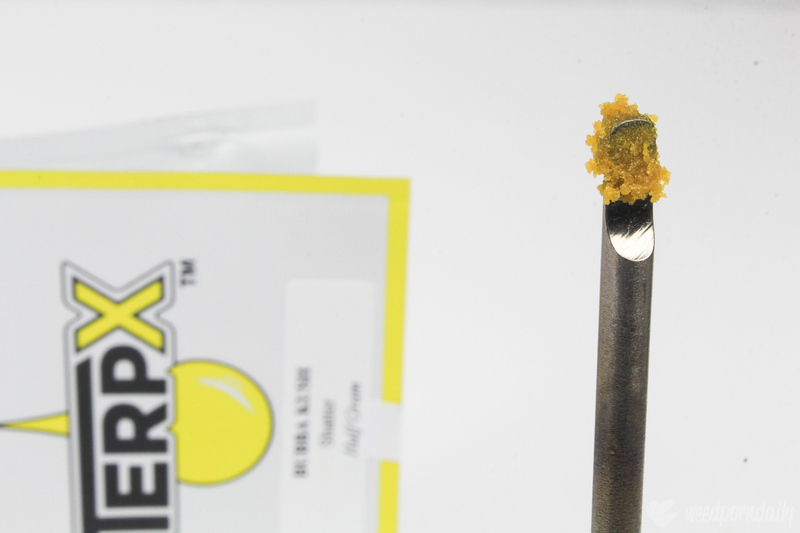 One dab of this Bubba Kush by TerpX and the room smells like a classic California sesh, with dank musky trees and pepper terps wafting through the air. Cracking open the PTFE paper snaps stoner's necks as they quickly turn to discern where that loud is. You get up close and you're assaulted with a relentlessly sharp odor of acidic plant pulp emanating from what seems to be a pile of brown sugar. And when you finally get a dab, you feel the ghost on OG weigh down on your back, melting away your pain and relaxing your body. But like any gangster, they bring a layer of paranoia and anxiety behind your back. This Bubba Kush is a blast on a few different layers, let's dig deeper into this indica's expression. I picked up a gram of this Bubba Kush by TerpX from the Bud and Bloom dispensary in Santa Ana. It cost me $30 for the gram, it's their cheapest concentrate they stock. It comes packaged in folded square pouch, branded with yellow border and the TerpX logo. The strain name is on a separate sticker on the front, that covers another sticker that seals the package. One side is a resealable pouch that opens from the bottom. The seal parts tends to break on me, coming unglued from the paper, making a hole in the seal. It might because of how rough I tend to be, might be faulty packaging. Beyond the packaging, the actual concentrate comes secured on teflon (PTFE) paper, making it easier to scrape up and less likely to soak up wetter hash. It's trim run, I know cause the budtender told me, it doesn't tell you anywhere on the package. But we're beyond the package, so let's acknowledge how bomb this hash oil is. This Bubba Kush becomes a crumbly mess of golden pebbles when you break into the unadulterated brown sugar consistency. If I showed you this concentrate without mentioning trim, you'd think it was nug run or live resin. I can put this stuff side by side with BHO I've paid $60/g or more for in the past. It goes to show that looks can only go so far to determine quality. It lets you know this isn't full of lipids and chlorophylls with it's fluffy and golden state (rather than goopy and green/dark). I love hash with this consistency, it makes dabs pretty easy, you just scoop up as much as you need. No snap, pull, and lose weed to the carpet -- or the endless scraping of wet and waxy oils. It looks great, yet smells insane. In a not-good way. It's the type of hash oil that you open in a closed room and take over with it's terps. But the smells not the best. It's got a smell that stings your nose from how acidic it is, and smells more like a fresh plant more than the deeper musky forest tones you'd normally get from a Bubba or OGs in general. 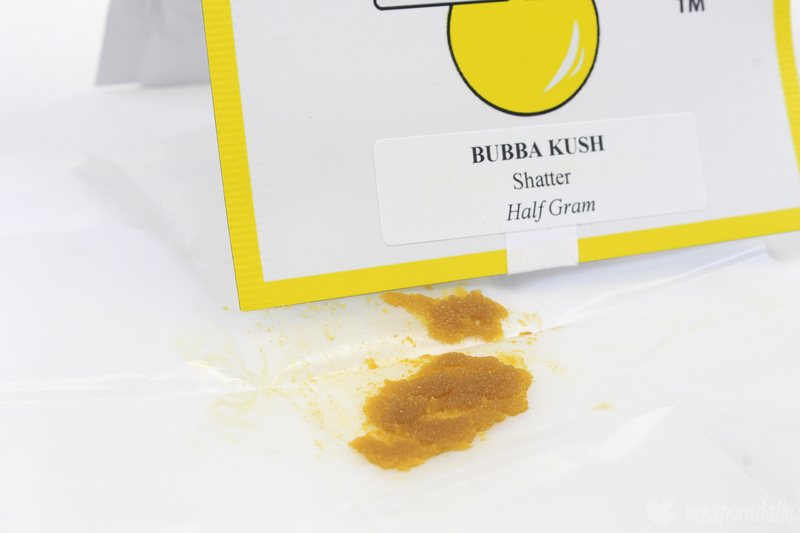 A more familiar Bubba Kush profile reveals itself in a dab, with the deeper tones emerging when the hash is heated. But it's still nothing to go crazy over, you get a better second-hand smell from someone else taking the dab, than the actual dab itself. The high's alright. You feel a weighted blanket on your body, particularly the upper back and it drizzles down to the lower. You feel I'm not a huge fan of it. It doesn't sync up with my style of sativa smoking, and even when I try to use it for relaxing it makes me paranoid and anxious. Potency could also use some help, I take pretty fat dabs and don't feel as effected as I should. 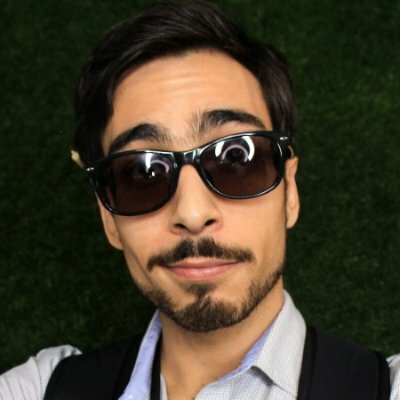 I smoked up a half gram in a day or two, versus the usual 3-4. And as much as the pain is melted, I can still feel the knives digging into my back from injuries. On the bright side, this strain is fairly smooth for a trim run, with no cough and minimal chest pain after even fat dabs. Smells crazy, looks like golden sugar, and gets you chill and tense at the same time. It's an decent strain, but not something I'd leap for next time. I picked it up because it was the first time I'd seen a Bubba Kush so sugary, so I'd hoped the flavor would be phenomenal, and it was a bit of a let down. The extraction is on point, just not right starting product. Something to consider if you dig indica dominant hybrids, but something to pass on if you need intense pain relief. I give this strain a 7/10, a solid score for a fairly solid quality concentrate.